There’s an amazing bakery/restaurant a couple of miles from my apartment (and also directly across the street from my former Weight Watchers meeting location, how cruel) called Milk. They serve all sorts of salads and sandwiches, but what they do best are desserts, specifically ice cream treats and cookies. My favorite is their coffee toffee crunch ice cream sandwich–a huge scoop of their homemade coffee toffee crunch ice cream sandwiched between enormous Parisian macarons. And if I ever become successful at making macarons, you better believe I’ll put ice cream between them. In the meantime, I decided to give another Milk favorite a try. These cookies live up to their name–they’re ooey, gooey, and very, very chocolatey. Unfortunately, mine came out kinda ugly and looking absolutely nothing like the ones at the store or in the picture, but they taste pretty damn good and will satisfy any chocolate craving! I’m not a milk drinker, but these cookies were so rich they were screaming “drink milk!” to me. I also think eating them warm with ice cream would suffice too (you can get them like that at the shop). Photos of the process here. Also, I doubled the recipe because I’m bringing them to a party. In a bowl set over a pot of simmering water, melt the unsweetened chocolate and butter. Remove from the heat and cool slightly. In the bowl of a mixer with a paddle attachment, or in a large bowl using a fork, combine the eggs, vanilla and sugar. Mix just until incorporated and set aside. Sift together the flour, cocoa powder, baking powder and salt into a medium bowl. Set aside. Add the melted chocolate to the egg mixture and mix just until combined. Stir in the sifted dry ingredients and mix just until combined, then stir in the bittersweet chocolate. Cover the batter with plastic wrap and refrigerate for at least 1 hour to chill thoroughly. Heat the oven to 350 degrees. Divide the dough into 18 portions. Grease your hands (to prevent the dough from sticking) and shape the portions into balls. Place the balls on a greased, parchment-lined sheet pan, leaving 2 to 3 inches between each. Bake until the edges of the cookies are just set and the center is still soft, 10 to 12 minutes, rotating the pan halfway through. Place the cookies, still on the parchment, on a rack and cool completely before serving. They will be very soft. Recipe adapted from Milk, via the LA Times. i’ve been to milk a few times, not lately, but have never had their cookies. the words ooey-gooey get me though. These sound amazing. Unfortunately I used the bulk of my chocolate making a ganache this weekend, so I need to do a grocery pit stop before I can make these! I like ooey-gooey anything! 🙂 your blog always does the sinful stuff right! So neat that you tried a recipe from Milk! I love that place. Their ice cream bon bons are incredible! And I agree about all your descriptive adjectives for the double chocolate cookies, which I’ve purchased before. Yum! Well, this is an oldy but goody. 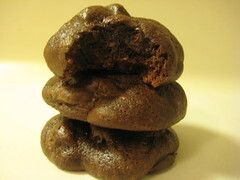 Anything called ooey gooey double chocolate sounds decadent. Cookies don’t have to look good, they only have to taste good. If they scream out milk, they must be incredible. I just doubled the recipe and put it all in a bundt pan & it looks and smells AMAZING!!! !